Only do the traditional holiday stuff you enjoy doing. If cooking a Christmas feast makes you miserable, your family will be thrilled with frozen pizza. Make the Christmas of 2015 about who we are instead of what we do, buy or cook. What you eat, drink or smoke seems to have little to do with it. Even love came panting in at fifth place while positivity narrowly edged out humour which barely slid under the wire to make the top ten. Family and friends received an honourable mention. But look again. Hold the list up the Looking Glass. Perhaps what's not on the longevity list is more important than what's there. I don't see money anywhere. Nope, it's not there. Oh, wait. Yes, it is! "Travel while you're young and able. Don't worry about the money." Material possessions are also nowhere to be found. After celebrating one hundred Christmases, it never occurred to them to mention the presents, the food or the decorations. Also conspicuous by its absence is caring what other people think of us and striving to impress them. Y'know, the proverbial Joneses. Our boss, co-workers, neighbours, even family and friends. In fact, our centenarians all agree we should surround ourselves with positive people we can be brutally honest with, love, enjoy and treat with kindness. After celebrating one hundred Christmases, it never occurred to them to mention the presents, the food or the decorations. And if we were honest, the work and expense required to do the traditional Christmas "thing" probably doesn't crack our top ten favorite things to do either. Here's an idea. This Christmas, celebrate like a centenarian. Only do the traditional holiday stuff you enjoy doing. "But, but," you say, "what will the neighbours think? They always compliment us on how we decorate the house each Christmas!" Good! So let 'em decorate their own houses and pay the electrical bill for a change. They owe you one. "Oh, but Lenora, you don't understand! The grand-kids will mope if we don't put up that sap dripping, glorified cat scratching post known as a Christmas tree." Well, my heart's been filled with Christmas joy for the past thirty-five years, and neither my family nor I have ever put one up. Next. "We simply cannot skip the Christmas feast. Yeah, the long hours in the kitchen turn me into a sweating, screaming shrew, but what will the family say if I don't?" I'm so glad you asked. Because I know exactly what they will say if you do. My family had plenty to say while resting their over-stuffed bellies after the unrivalled Christmas feasts my grandmother insisted on putting on despite our protestations. We may have looked Norman Rockwellian from the outside, but look closer. Every doggone Christmas, Grandma would be weeping into her red-and-green apron as she cooked, salting the gravy with her tears because Grandpa was being an ol' stingy meany again. Meanwhile, Grandpa was quietly fuming because, yet again, Grandma had spent way too much money on way too much food and way too many presents. All the relatives would be making awkward chit-chat and forcing fake laughter while feigning to ignore their host's and hostesses' conflict. And the day would wind up with Grandma using clean-up as an excuse to mope in the kitchen all day, even anointing the shiny bottoms of her copper-bottomed saucepans with ketchup, only to emerge just as her guests were leaving, giving her yet another excuse for a jolly good pity party. And a "bah humbug" to you too! I'm sure this doesn't describe you, but believe me, if cooking a Christmas feast makes you miserable, your family will be thrilled with frozen pizza. "But Lenora, you wouldn't be so cold-hearted as to threaten the sacred tradition of gift giving? Surely, you won't rush in where angels fear to tread." Well, according to Psychology Today, some people, "...get depressed at Christmas with the focus on gifts and the emphasis on "perfect" social activities. 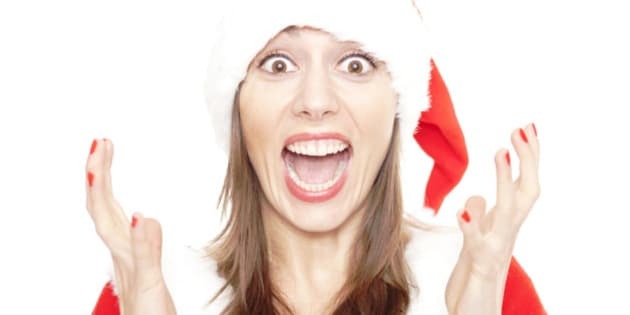 Still others become anxious at Christmas because of the pressure (both commercial and self-induced) to spend a lot of money on gifts and incur increasing debt." Let's follow the centenarians advice and make the Christmas of 2015 about who we are instead of what we do, buy or cook. Speaking from personal experience, I never got a Christmas present in my life and lived to tell the tale. Did I say lived? Nay, I thrived. It taught me not to envy others nor be materialistic, a principle that has served me well, as long as I stay away from garage sales, thrift stores and my very unfortunate eBay addiction. In the final analysis, most of our Christmas traditions boil down to appearances and "what will people think?" I don't see anything about keeping busy pursuing our passions in that. So here's an idea. Let's follow the centenarians advice and make the Christmas of 2015 about who we are instead of what we do, buy or cook. Let our Christmas decorations be the adornments on our souls... our kindness, our joy, our honesty, our laughter and our love. As Scrooge said, "I will honor Christmas in my heart, and try to keep it all the year." We'll be happier and so will our guests, as well as those we serve when we start a new family tradition by volunteering at the local food pantry or soup kitchen. Perhaps Edmond Rostand expressed it best in Cyrano de Bergerac.